The country’s first ever partially biojet fuel-powered aircraft took off from Dehradun, Uttarakhand, on August 27, and landed successfully in New Delhi. The 72-seater Bombardier Q400 belonged to SpiceJet, India’s fourth-largest airline by market share, and used a blend of 75% aviation turbine fuel (ATF). “It (biojet fuel) has the potential to reduce our dependence on traditional aviation fuel by up to 50% on every flight,” Ajay Singh, chairman and managing director of SpiceJet, said in a press release. The biofuel used by SpiceJet to mark this momentous flight was developed by the Indian Institute of Petroleum, Dehradun, from the seed of the jatropha crop. It meets the specification of aircraft engine makers Pratt & Whitney and Bombardier, SpiceJet said, and can potentially reduce the airline’s carbon footprint by 15%. This is not the first time an airline has experimented with biofuel. In 2011, Alaska Airlines operated 75 selected flights on a cooking oil blend, while Dutch airline KLM flew weekly biofuel flights between New York and Amsterdam for six months in 2013. India is expected to become the world’s third-biggest aviation market by 2025 on the back of a domestic-travel boom. That is now leading to fierce competition and a bruising fare war, that is hurting profits of airlines. Most airlines in India are under pressure from a depreciating rupee and surging fuel prices. Besides, domestic carriers are mostly pursuing volume over profitability. With airlines flying so many flights, fuel demand has surged. In the April-June quarter, some of the biggest players incurred massive losses. While net profits of IndiGo, India’s largest airline by market share, spiraled down 97% year-on-year to Rs 28 crore ($4 million), Spicejet reported a loss of Rs 38.06 crore. Jet Airways’ losses stood at Rs 1,323 crore with its fuel expenses rising 35%. It is interesting to note that back in 2013-14, SpiceJet’s rival, IndiGo, had toyed with the idea of using biofuel to power some of its fleet, before deciding to shelve the plan. Back then Indigo considered biofuel to be a cheaper alternative to ATF idf oil prices continued to rise. But at that time it was cheaper and more convenient for them to import jet fuel from Singapore, leading to the plan being shelved. According to IATA, aviation industry contributes to 2% of the total greenhouse gas emissions in the world which will rise as the aviation industry is expanding. IATA has set a target for one billion passengers to fly on aircraft using a mix of clean energy and fossil fuels by 2025. IATA has set targets to mitigate carbon emissions from air transport — an average improvement in fuel efficiency of 1.5% per year from 2009 to 2020, a cap on net aviation carbon emissions from 2020 (carbon-neutral growth) and a reduction in net aviation carbon emissions of 50% by 2050, relative to 2005 levels. 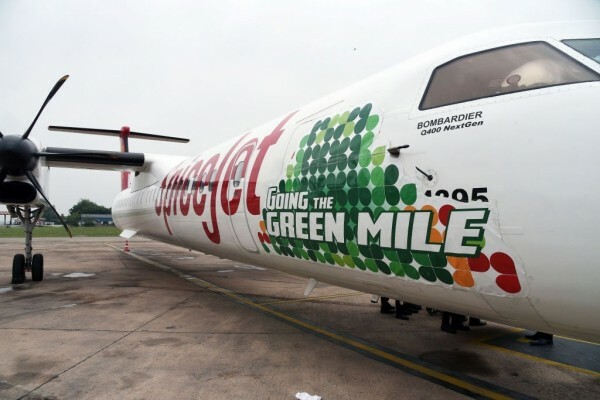 With the introduction of biofuel to its fleet, SpiceJet says it hopes to be much ahead of these targets. The move is a good start to address concerns around the poor health of the aviation sector. Under these circumstances, Bio jet fuel has the potential to halve the fuel cost of every flight and bring down fares. Nitin Gadkari also said that a cabinet note would soon be moved to come out with a special policy on the use of biofuel in the aviation sector. With a strong government policy in place and efforts from airlines like SpiceJet to experiment, biofuel will hopefully usher in a new era of reducing dependence on oil in a highly price-sensitive industry.